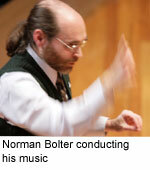 "Norman Bolter is an accomplished and prolific composer." "For me his song is direct, meaningful, flowing and effective. ...a direct connection to a most vital musical soul." Norman Bolter's compositions are unique in conception and execution. All of his compositions for trumpet are extremely well suited to the instrument. He exploits all of its possibilities: lyrical, dramatic, range of timbre, virtuosity, and emotional." "Norman Bolter's music is amazing and wonderful. Like other well known virtuosos who composed music for their performances, such as Arthur Pryor, J.J. Johnson, and Fritz Kreisler, he has created a style that is perfectly suited to the trombone. These works are really valuable for our repertoire." A commissioned work by Norman Bolter enjoys the same dynamic and engaging attention as any of his compositions, because he treats all his music making as a living process. Air-ev Productions is very much interested in promoting the human story of Mr. Bolter's approach to writing commissioned works, including how he approaches composing in the first place and why he composes music. This page tells that story and includes also information about the administrative process involved in commissioning a new work by Mr. Bolter, for those wishing to do so. "Composing music gives me a chance to be in a process of connecting to the territories I'm composing about. At times, it's very challenging because it often requires that I confront certain habits or biases in myself, such as preconceived ideas about the subject that would prevent me from really getting inside of (on the frequency of) what I want to write about. I'll give you an example. I was writing a piece about inspiration but, in the midst of it, I got stuck, hit a brick wall, because I kept trying to write all this hyper-charged music (which I thought was what inspirational should be), resisting more tranquil, quiet music that was turning up in me because I thought, "That can't be 'inspiration'!" And then I realized what the problem was. I had biased inspiration. Once I realized that, it all started to happen and I completed the piece. So, what I'm saying is that composing gives me a chance to grow as a person as well as a composer. And it gives me a chance to build a real living relationship with the "essence" of the particular subject I'm trying to write about or communicate with, which is a very special thing actually." If a particular person, rather than an organization, commissions you, does that make a difference? "If another person commissions me to write a piece of music for them, I will talk with them and ask them what they feel close to in the natural worlds (nature), such as lakes or birds and so on. In some cases, my wife (Dr. Carol Viera) and I will think about an aspect or expression in the natural worlds that might resonate with that person. When Joe Alessi commissioned me to write a piece, we had a few conversations about what he likes in nature and also about some dramatic life experiences he has had. From this exchange, Carol suggested that something about the Arctic region of the planet might be a fascinating and compatible territory to explore. I agreed and began immersing myself in the territory, drawing on everything I could about the Arctic, including my own experience of flying over this region. The process finally culminated in music and I'll never forget when the first notes of the opening appeared and how the room was filled with a sudden silence and chill! The completed work is called 'Arctic Emanations'." How is it different when an organization commissions you? "Now, when Pro Arte Chamber Orchestra commissioned me to write a piece for trombone and chamber orchestra, it was left to me to decide what the music would portray. They simply gave me the instrumentation and the desired length of the work. But I don't just think, "I'm writing a 'trombone concerto'." It has to connect to something meaningful, at least for me, and so I decided to compose 'IOURS,' a piece about our local cosmic family of moon, earth and sun. When approaching this work, I already had a very alive relationship with this 'trio' but writing 'IOURS' caused me to deepen my relationship with my cosmic family in terms of valuing their individual natures and seeing how they actually are living things! The moon section (URS) caused me to develop some new techniques, such as use of a 'u' vibrato--created by a rapid movement of the tongue--while at the same time playing a note and singing another. And that's another thing I love about connection and composing, namely, trying to find, through discovery, the musical language that will best express what is turning up in me. Many times this gives way to new techniques and ways of thinking." "Music is another expression of life energy which contains all the raw organic processes of any life form. This is why I choose to compose music primarily about the natural worlds or human qualities and special human stories, to offer inspiring and uplifting energies to the world through the music. For me, this is an important attitude and position to have when treating music as a living thing. Having said that, some people might wonder, 'Then where did the tuba piece Clouncey come from?' Well, there's a spectrum of human expressions, characters and natures. And, in Clouncey's case, it was written for somebody who is very theatrical and that piece has a lot of theatricality and also humor in it and that can be very uplifting for people. Remember that doctor, what's his name? Patch Adams? He found that humor was a great healer. And you know what? Sometimes the right thing at the right time is a 'high' human response. It's about need, which does not always match our biased sense of what 'high' is. So there's the biased thing again. People (including me, as I said in the 'inspiration' story) get stuck in their views, boxed by their biases, about what they think things are and that's one of the things we, Carol and I, are trying to challenge. Oh, I have to tell you another story about that. We were doing a concert and my music was part of the program, but we also, on this occasion, were doing some standard repertoire, including Elgar's 'Enigma Variations.' And one of the people who came to hear the concert was into anagrams (and I am too, so I'm not saying anything's wrong with that). But here's where things got twisted and put in a box, and we couldn't talk her out of it. She knew a man who had a self-chosen name (as people in many traditions do). Anyway, his name was Regal, and he also was into music. And she was absolutely sure that Regal wrote 'Enigma Variations,' and was totally convinced that we were trying to 'hide' that truth by saying somebody named Elgar really wrote that music. Why? Because an anagram of Regal is Elgar and that was her 'evidence' that Regal wrote it. She got stuck on her own way of seeing things (bias) and couldn't see past it to the truth. Interesting, isn't it? Because, of course, Elgar did write 'Enigma Variations,' a long time before Regal was born." If you or your organization would like to commission a new work by Norman Bolter, please contact us to discuss your needs and wishes. If the decision is to proceed with a commission, Air-ev Productions will draw up a contract to everyone's mutual agreement, setting out the various timings and other practical arrangements, including preparation of score and parts. The person or persons commissioning the work will enjoy the opportunity of world premiering this new work and the name of the commissioning person or organization will be included on the title page, remaining there as a permanent part of this work and music's history. To read more about Norman Bolter's professional experience as both composer and performer, please see Mr. Bolter's biography.